Lionel Messi met with Argentine Football Association (AFA) president Claudio Tapia and national team coach Lionel Scaloni as they planned for the future. 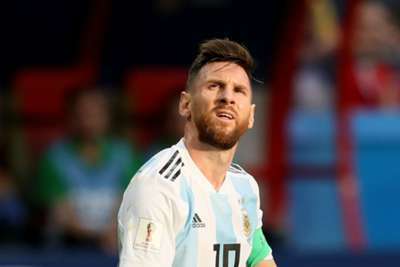 Barcelona superstar Messi has not featured for Argentina since their 2018 World Cup last-16 elimination at the hands of eventual champions France. Their campaign was blighted by reports of unrest between the players and then-coach Jorge Sampaoli, who was dispensed with after the tournament. Messi has sat out the past three sets of Argentina fixtures, but Tapia suggested a return could be on the horizon for the 31-year-old. The AFA president shared a picture on Twitter of he and Messi at the Santiago Bernabeu during Sunday's Copa Libertadores final between River Plate and Boca Juniors and confirmed they held talks with Scaloni, who was offered the Argentina job on a full-time basis in November. "Leaving Madrid after the Libertadores Superfinal and several intense days of work," Tapia wrote. "Finishing the year and projecting what is coming, we met with Scaloni and Leo Messi." Argentina will not play a competitive fixture until the 2019 Copa America in Brazil, where they will hope to win a first senior international trophy since 1993.